Creating a safer environment for our employees takes more than just a few certification cards, some safety handouts from a course, and lip service. It takes fostering the right culture and a never-ending commitment to training, assessment and reinforcement to keep our employees safe in an ever-changing work environment. 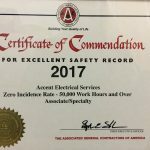 At Accent Electrical Services, we profess that “Every employee goes home uninjured and healthy every day.” To us, this is not just meaningless corporate-speak. It’s something we strive for day in, day out. Safety is not just what we do, it is who we are. 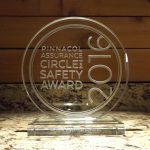 Safety is one of our core values and part of our company culture. It is a reflection of how we care for each other and work together. 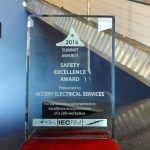 State regulations for safety are only a starting point for Accent Electrical Services. We go above and beyond just the minimum expectations to ensure our employees are walking onto a safe job site each and every day. Given the serious demands of our industry, Accent is a drug-free workplace and we provide a comprehensive safety orientation and appropriate personal protective equipment to all new hires. Once on the job, our foreman conducts daily job hazard reviews and weekly “tool box talks” to ensure safety is always top of mind. 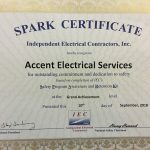 In addition, Accent Electrical Services provides training on topics ranging from First Aid/CPR, OSHA requirements, specialty equipment and other hazards. 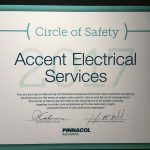 Accent even has our own Safety Committee, which is made up of executive management, project management and field personnel. Their job is to assist in implementing our safety procedures and ensuring buy-in at all levels of the company. From top to bottom, we encourage communication and collaboration to help us provide the safest workplace possible. 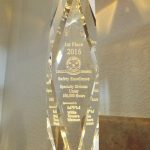 We see our commitment to safety as a reflection of our commitment to our employees. They are our most valuable resource. Without them, we can not succeed.